⬅ Is It Wrong to Make a Vow or an Oath? 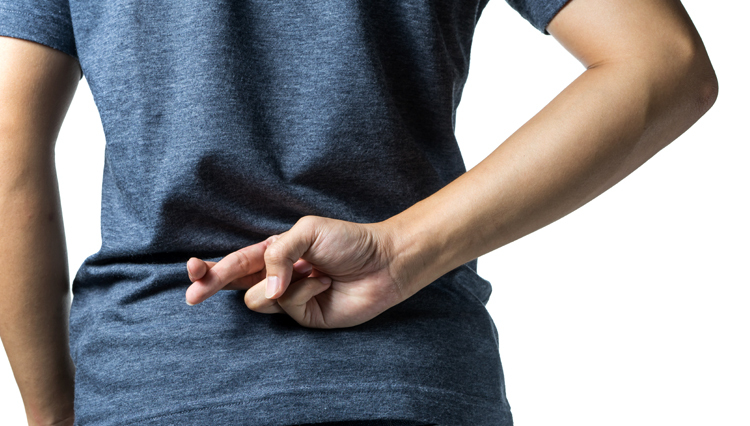 What Is a Surefire Way to Know If Somebody Is a Liar? What is a surefire way to know if somebody is a liar? We are working our way through Jesus’ Sermon on the Mount, the early part at least, looking at those six times that the Lord said, “You have heard it was said, but I say to you,” and He’s not, of course, going to contradict Himself or contradict the law of Moses, which He gave, even though some people seem to think that. No, He’s going to fulfill the law. Obviously, it wasn’t wrong to make vows. It was right to make vows, but it was wrong if you didn’t intend to keep your vows or it was wrong if you didn’t keep your vows because God is a God of truth, expects us to be people of God who tell the truth. All right. When Jesus said, “You have heard it said, ‘You shall not make false vows,’ in Matthew 5:33, ‘but you shall fulfill your vows to the Lord. '” When He says, “But I say to you,” here’s my counterpoint. He didn’t say, “Make no oath at all.” He said, “Make no oath at all either by Heaven for it’s the throne of God or by Earth,” etc., etc. What He’s forbidding is the practice of making vows coupled with the swearing of an oath, which is nothing more than a ruse to try to convince the person to whom you’re making the vow that, this time, you, who normally can’t be trusted, a liar, this time, you really mean business. It’s always been wrong to be swearing and adding an oath because it’s an admission that you’re a liar, and in order to convince somebody, whether it’s God or somebody else, that you’re telling the truth this time, you put on this big production. I swear by the throne of God that I will thus and so. You might as well just say, “I am normally a liar, and you know I can’t be trusted, but if I can trick you into believing me this time by making an oath, I’m gonna give it my best shot.” You’re corrupt to the core. God has always expected us, what Jesus is going to go on to say here, let your yes be yes and your no be no. You don’t need to be adding all these oaths. Where’d that whole oath idea come from? Well, it was a practice embedded within the culture of Israel as taught and exemplified and practiced by the scribes and Pharisees. How do I know that? Because Jesus said so. If you would take a look in Matthew chapter 23, which Bible students know the 23rd chapter of Matthew is Jesus’ woe to the scribes and Pharisees, and He just lists all kinds of things He has against them, what hypocrites they were. Oh, my goodness, pathetic, pathetic, pathetic on every count. Remember, in the Sermon on the Mount, He said, “Unless you’re righteousness exceeds that of the scribes and the Pharisees, you will not enter the kingdom of Heaven,” another way of saying, “The scribes and Pharisees are all going to hell.” Why? Because they’re murderers, even if they don’t physically commit murder. They’re murderers at heart because they’re always spewing venomous hatred. They’re adulterers, even if they never commit physical adultery. They’re full of lust. We haven’t gone to this yet, but they’re continually divorcing and remarrying the women of their fantasies, and they’re liars, and all liars have their part in lake of fire. How do we know they’re liars? Because they’re always swearing coupled with oaths, and, worse, they’ve got a whole system where they’re sometimes, even when they swear by oaths, they’re allegedly not obligated to keep their word. I remember when I was a kid … This is universal. I think it with all kids. If you’re crossing your fingers, it’s okay to lie, and I remember we’d tell people stuff, and we’d have our fingers behind our back, and we’d say, “I’m gonna …” We’d tell our friends, “I’m gonna buy you an ice cream cone.” A younger kid, we’d tell them that, and they’d get, “Oh, good, good,” and we’d go, “Had my fingers crossed.” Somehow, that made it okay to tell a lie and to deceive somebody. Well, the Pharisees had a grownup version of that. Look, look here. Matthew 23 and verse number 16. We don’t have time, but we could have read 15 verses of denunciations of the scribes and Pharisees before this, but we’re breaking into the middle of the rant. “Woe to you, blind guides, who say, ‘Whoever swears by the temple, that is nothing. '” You don’t have to keep your word then or keep your vow then, but whoever swears by the gold of the temple, whew, he is obligated. Obligated what? To keep his vow. “You fools and blind men, which is more important? The gold or the temple that sanctified the golds?” Jesus is telling, “You got misplaced values.” That’s just the beginning. “And whoever swears by the alter, that is nothing.” You don’t keep your vows as long as you have your fingers crossed, long as you say … If you say, “I swear by the alter,” the Pharisees said, “You don’t have to keep your vow,” but if you swear by the offering on the alter, then you’re obligated to be telling the truth. Can you believe this? This is why when Jesus said, “Unless your righteousness exceeds that of the scribes and Pharisees, you won’t enter Heaven,” because these people were pathetic, absolutely pathetic. Religiosity to the Nth degree, but morality zippo, nada, none. All right. I’ll have a little bit more to say about this on our next Little Lesson. Thank you so much for joining me. God bless you.